Molton Brown gift sets are a perfect idea for pampering yourself or someone you love. The bath, body, and beauty products manufactured by this London company have blend exotic scents to awake your senses and make shower time an exciting treat. Molton Brown gift sets are available for women and men alike. Whether you are looking for a gift for your wife or your father, Molton Brown gift sets are an ideal choice. These luxury gifts come in a wide range of choices and you can opt for gift sets for her and him, as well as gift sets containing luxury products for the home. 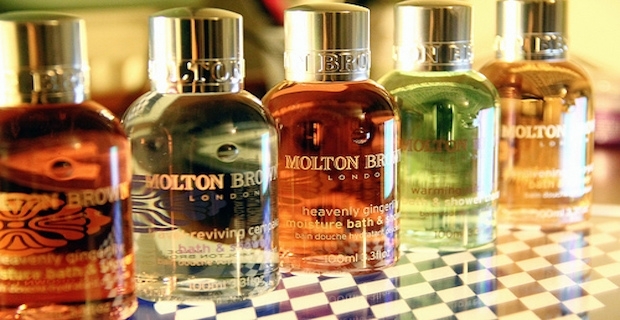 Molton Brown gift sets are available in their online store as well as in various department stores. The Bath and Body Treasure collection is one of the best choices if you want to test some of the best Molton Brown products all in one go. This 12-piece set includes a mix of body lotions and body washes in travel size bottles, all wrapped up in a festive gift box. Another option is The Great Escape Collection that features five of Molton Brown's signature exotic scents in the form of body washes and body lotions. Whether your guy loves sports or enjoys a little bit of pampering before going to sleep, there is a Molton Brown gift set for him. The Relax & Sleep Well Gift Set includes a relaxing a shower gel and a sleep balm infused with soothing Ylang-Ylang. The Black Peppercorn Favourites Gift Set contains Molton Brown's award-winnign shower gel for men, as well as an exfoliating bodyscrub soap bar and a body lotion. If you are looking for a homeware gift, the Molton Brown gift sets for home can be the right answer. Opt for one of the numerous aroma reeds to make your home more welcoming or choose the Verve Piccolo Candela Collection that includes some of the best selling Molton Brown scented candles.